Republican John McCain pushed back on Wednesday against Democratic criticism that he misstated when the troop buildup ordered by President Bush began, saying elements were put in place before Bush announced the strategy in early 2007. He told reporters during an unscheduled stop in a super market that, what the Bush administration calls "the surge" was actually "made up of a number of components," some of which began before the president's order for more troops. It's all a matter of semantics, he suggested. McCain said Army Col. Sean MacFarland started carrying out elements of a new counterinsurgency strategy as early as December 2006. At issue are McCain's comments in a Tuesday interview with CBS News. The Arizona senator disputed Democrat Barack Obama's contention that a Sunni revolt against al Qaeda combined with the dispatch of thousands more U.S. combat troops to Iraq to produce the improved security situation there. McCain called that a "false depiction." CBS News anchor Katie Couric spoke exclusively Tuesday to Barack Obama in Amman and to McCain via satellite. Democrats jumped on his comments. They said McCain's remarks showed he was out of touch, because the rebellion of U.S.-backed Sunni sheiks against al Qaeda terrorists in Iraq's Anbar province was under way well before Bush announced in January 2007 his decision to send 30,000 additional U.S. troops to Iraq. McCain asserted he knew that and didn't commit a gaffe. "A surge is really a counterinsurgency made up of a number of components. ... I'm not sure people understand that `surge' is part of a counterinsurgency." Speaking on CBS Tuesday of a Sunni sheik who approached Col. MacFarland, McCain said, "Because of the surge, we were able to go out and protect that sheik and others. And it began the Anbar awakening." On Wednesday McCain continued to try to portray his opponent as naive on Iraq while the Illinois Democrat is visiting the war zone, the Middle East and Europe. 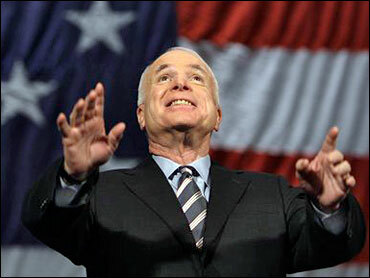 "I am again deeply disappointed that Sen. Obama will not recognize that the surge has succeeded," McCain said. He said that "no rational person" could think otherwise. McCain said he had been briefed by Col. MacFarland, commander of 1st Brigade, 1st Armored Division, in December 2006 to discuss the strategy that remains in force today. Bush announced the surge in January 2007 and the first of the new troops began arriving in Iraq in mid-February 2007. McCain made an unscheduled stop at "Kings Supermarket" in a shopping mall here, and greeted shoppers and commiserated with them on the soaring costs of both food and fuel. "Among other challenges, Americans face the price of milk at over $4 a gallon," McCain told reporters as he stood in front of a dairy case. But questions quickly turned to other subjects. McCain brushed aside a question on a running mate when asked whether Minnesota's Republican governor, Tim Pawlenty, was now at the top of his list. "I can't mention names," he said. But asked what he thought of Pawlenty, McCain said, "He's a great, fine person." "He, and (Louisiana Gov.) Bobby Jindal and a number of other governors are the future of the Republican party," McCain said. McCain had been headed to Louisiana later Wednesday, but bad weather generated by Hurricane Dolly, forced a last minute postponement of the trip. He was going to Ohio instead. Earlier, campaigning in Wilkes-Barre, Pa., McCain credited the recent $10-a-barrel drop in the price of oil to President Bush's lifting of a presidential ban on offshore drilling, an action he has been advocating in his presidential campaign. He criticized Obama for opposing drilling on the Outer Continental Shelf. The White House didn't go that far. Presidential spokeswoman Dana Perino said the price drop also could reflect diminished demand. "I don't know if we fully deserve the credit," Perino said. "We don't predict what happens in the market," she said. "We can't really tell. Certainly, taking that action would send a signal that at least the executive branch is serious about moving forward and increasing the supply we have in America." A barrel of light, sweet crude fell $1.86 to $126.56 on the New York Mercantile Exchange. That's down from more than $140 a barrel earlier in the summer. There are 42 gallons in each barrel.